This is a nice clean working orbit level, marked "MAYES NO. OR MADE IN U.S.A.". 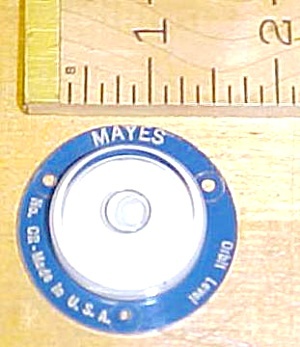 The blue outer flange ring is 1.7" diameter, and has 3 clearance holes for mounting this unit to about any type of part that you can drill holes in for screws. The bubble glass is in very good shape, works good. A nice vintage, easy to read bubble level! Unique!